Loose leaf tea on the go. For a Mom, tea time is always on the go time! I love having the opportunity to make my tea in a libre tea glass and know that I am mobile the entire time. There are times I can sit in the chair and simply enjoy. Others I may have to move to a different room to help a child and my tea comes with me! I have used the tea glass in the past, and recently was able to review the 10 oz mug. I LOVE it! Love the traditional feel of the handle in my hand while sipping tea. I love how with libre tea glasses the tea and infuser are together, no need for messy tea bags. I also love that my tea continues to steep while I drink giving me full flavor. Another huge plus is that the glass and poly walls of the mug keep the outside cool and the tea warm. I never burn my hand when holding this mug or the tea glass. It can be deceiving when you go to take a sip and realize the tea is HOT! The Libre Tea Mug is one of the greatest inventions!! I have loved using mine daily for a huge variety of teas. It works best with herbal tea. It is on sale right now for $21.13!! Hurry, I have no idea how long this sale will last! The libre glass is super easy to use, watch this short video for information. Check out Libre Tea and tell me something fun you learned from their website! Use the Rafflecopter HERE to record your entry for your comment below. 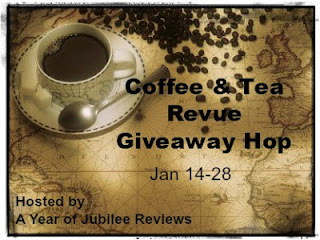 Be sure to stop by the Coffee Tea Revue Giveaway for other great prizes! I recieved a libre tea mug in exchange for an honest review. I like that it is glass on the inside! Its fun that you can carry it in your backpack or purse and drink tea anywhere. I find that the Libre glass’n poly mug that you can carry in your backpack or purseis a fun way to have your hot tea whenever you want. They have a pretty nice web site and I never thought about loose leaf tea having a smaller footprint than bagged tea! I learned that their cups/mugs have a glass interior and durable poly exterior. This sounds amazing! I prefer loose tea and love the thought of drinking it on the go. I like that it can also be used for tea with a limited steeping time. I learned that loose tea has a smaller environmental footprint than tea bags. I learned that you can reuse the loose leaf tea because it stays in the filter. Yay! More cups of tea :) That is not only delicious, but economical. 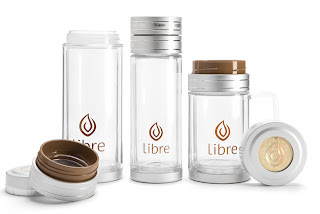 I am glad that the Libre Tea glass has a removable stainless-steel filter that keeps tea leaves in the glass, out of your mouth and is removable for easy cleaning. It makes it easier and more fun to use it.